Last Friday, 85 year old Jewish Parisienne and Holocaust survivor, Mireille Knoll, was murdered in her home, allegedly by her neighbour and an accomplice. The attackers stabbed her 11 times and then set her and her apartment on fire. Two men have been arrested for what the authorities are calling an anti-Semitic attack. Twelve years ago, a young French Jew, Ilan Halimi, was abducted, held for ransom and tortured over a period of three weeks and eventually murdered by a Muslim group calling itself the “Gang of Barbarians”.He was targeted because he was a Jew, although the anti-Semitic nature of the crime was not acknowledged by the authorities. Eleven years later in Paris, another Halimi, Sarah – a doctor and an orthodox Jew (and a distant relative of Ilan Halimi) – was viciously beaten by her neighbour and eventually thrown to her death out of a third storey window. Police were outside the building as she was being assaulted but failed to intervene. Although the assailant, a Franco-Malian Muslim was overheard shouting “Allahu akhbar” and happened to target the only Jew in the apartment building, authorities were initially reluctant to treat this attack as an anti-Semitic hate crime. Six years ago, Mohammed Merah, a 23 year old French petty criminal of Algerian descent, drove his motorcyle up to a Jewish school in the city of Toulouse just as children and teachers were arriving. He shot and killed a rabbi and his two young sons outside the school gates, and once inside the school grounds, he chased an eight-year-old girl, the daughter of the school’s head teacher, caught her by the hair and shot her at point black range. 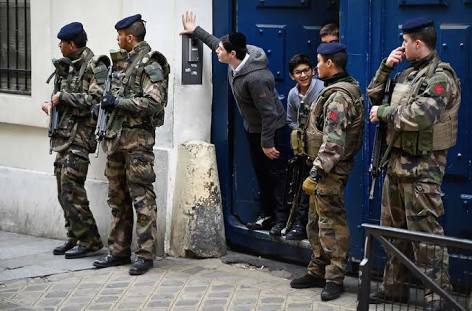 In January 2015, following the Charlie Hebdo attack, ISIS-inspired gunmen targeted a kosher supermarket in Paris, taking a number of customers hostage, ultimately murdering four Jewish hostages, before police stormed the store and ended the seige. Since 2006 some 40,000 Jews have left France. While the rate of Jewish emigration is currently slowing, rates of anti-Semitic activity, including violent attacks, remain high. In January this year, an eight-year old boy wearing a kipa (skullcap) was attacked as he walked to a tutoring class in a north Paris suburb. A few weeks ago, it was reported that the baby of a French rabbi received burns from acid that was placed in her pram. There have been numerous stories of Jewish children being beaten by anti-Semitic bullies at public schools. Jewish leaders have claimed that public schools are now unsafe for Jews. The worsening problem of anti-Semitism in France is mirrored throughout Europe, and the phenomenon has an impact even as far away as New Zealand. In 2017, Sarah and Emmanuel, with their two young daughters, took the bold step of emigrating from Paris to New Zealand, where they had no family and knew nobody. Both observant Jews, Sarah and Emmanuel were born and raised in Paris. Over the last 15 or so years, they noticed changes unfolding around them, including in their respective places of work, which they eventually felt impossible to ignore. As Sarah explains, there had always been some latent anti-Semitism around, but she felt there was a gradual change whereby it became acceptable and normal to make fun of Jews, Jewish customs and beliefs. At the same time, the threat of physical violence became ever more real and proximate. Sarah and Emmanuel paint a picture of growing antagonism toward Israel – fueled by a hostile media – along with widespread anti-Jewish sentiment among the growing North African immigrant population. This is further inflamed during heightened times of conflict in the Middle East and has contributed to the resurgence of an old-fashioned anti-Semitism which had previously lain relatively dormant throughout French society. Emmanuel worked as a teacher in a tertiary institution and noticed that, among the students that he taught, students with openly anti-Jewish views went from around 5% of his class, to a point where the vast majority of his students would be comfortable making anti-Semitic comments. As Sarah recalls, the word “Jew” started to be thrown around as a commonplace insult, such as, “Go on, give me some of your sandwich, don’t be a Jew”. At the same time, incidents were happening around them that struck terror, and these were happening with increasing frequency. Emmanuel says, “It was a good life but we were constantly worried, hearing things, very disturbing things about what was going on. Emmanuel and Sarah even took the step of changing their family name to a less obviously Jewish one. Unsurprisingly, the memory of the horrific events at the Toulouse school haunt Jewish parents throughout France. Emmanuel and Sarah’s daughters attended a Jewish school, and after the terror attack at the Jewish supermarket, daily school drop-offs and pick ups had to be organised with military precision. Although they tried to keep their decision quiet, their daughters had absorbed more than than they’d realised. Sarah overheard one of her daughters telling a friend, ‘“So anyway we have to say goodbye because we are going to a country where there is no military in front of the Jewish school’. And I just fell apart”. Starting again from scratch and leaving so much behind was a challenge, but Sarah and Emmanuel have little doubt that the decision they made was the right one for their daughters. As Sarah says, “I don’t know what’s going to be tomorrow but I don’t want to have any regrets and I want to be able to say ‘We did everything that we can to protect you from what could happen’”. Part of the appeal of New Zealand for Sarah and Emmanuel was its distance from Europe, and from the dangers and fear that they hoped to leave behind. The contrast to life in Paris has been stark. Sarah recounts how life in Paris involved waking in the morning to the sound of police sirens and going back to sleep at night with the sound of police sirens. “And when I came here and we were on Queen Street, and people [were] crossing the road at Victoria Street and I said, ‘Listen, it is noon, everywhere there are people, but there is no noise. The noise is not from the people but from the birds’.